Wednesday’s League Championship Series games got us much closer to knowing who will be playing in the World Series. Well, maybe. In the American League, it looks like the Boston Red Sox will be the ones moving on. But they didn’t take a 3-1 series lead without any drama, to say the least. It took some late heroics to get them their victory. Game 4 in Houston was a back-and-forth affair for a while. The Astros continued to get help from George Springer, who had a home run in the third inning to help close the gap, while the Red Sox saw Jackie Bradley, Jr. remain hot as he hit another home run, a two run dinger, to put them up 6-5 in the sixth inning. In the next two frames, they scored twice to make it 8-5. Then, Jose Altuve drove in Alex Bregman on a ground out in the eighth to make it 8-6. It would hold at that score, but only due to a great grab by left fielder Andrew Benitendi in the bottom of the ninth… with the bases loaded. The diving catch not only saved Craig Kimbrel from more embarrassment, but it allowed the Red Sox to win the game. If the ball went by him, the Astros likely would have scored three runs and won the game. Instead, the Sox need just one win in three games to advance to another World Series. There was drama in Los Angeles as well in NLCS Game 5 on Wednesday, but for the most part it came very early. Like extremely early. 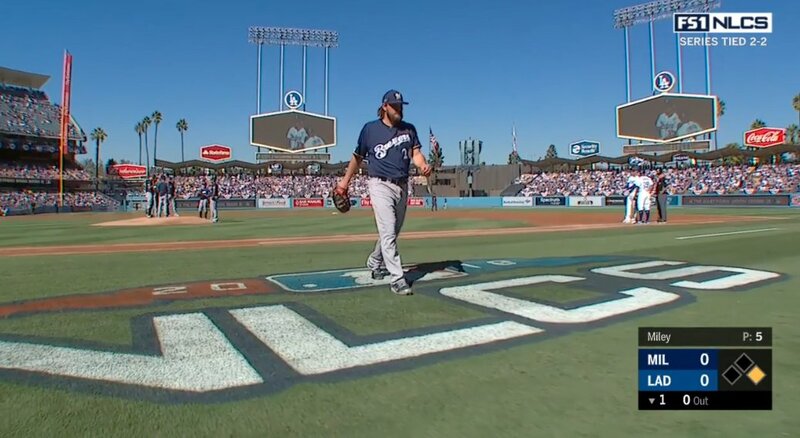 The big talking point was the Milwaukee Brewers’ decision to have Wade Miley start and throw five pitches before being hauled off for Brandon Woodruff. Yep. You read that right. Craig Counsell took mind games to a new level by pitching the lefty for five pitches, setting him up to start Game 6, in an attempt to fool the Dodgers. It may well have worked for a little while, with Lorenzo Cain driving in Arcia in the third inning, but after that, Clayton Kershaw was nearly unhittable. The ace would end up going seven innings, compiling nine K’s and just allowed the one run. He even scored a run as the Dodgers rallied in the sixth to take a 3-1 lead at home. They scored twice more in the next inning, virtually wrapping up the game. There was a little tension in the ninth, but the Brewers only pushed one run across to fall 5-2. That gives the Dodgers a 3-2 series lead and puts them one win away from advancing. However, the bright spot for Milwaukee is that both games will be at Miller Park.